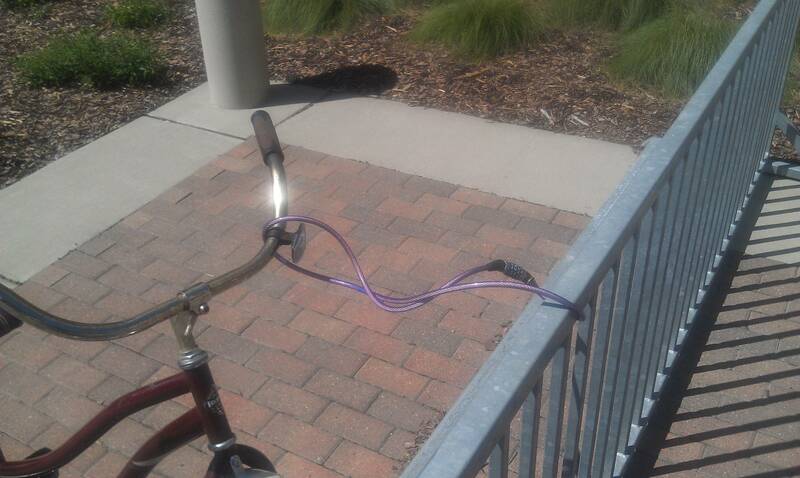 When locking your bike, the lock might not be the weakest part of your security. Always pay attention to what you are locking it to (both on the bike and the rack). Always run the lock through one of the frame triangles such as the rear stays, or below the crossbar, don't just run it through a wheel alone as that lets the thief remove your wheel and make off with the rest of the bike. If you have quick releases or expensive wheels, make sure you run the lock through them as well. This might involve you removing the front wheel and placing it at the rear so it can be included in your lock. Again make sure you catch the actual rim and not just a few spokes. Make sure you lock to something secure. Locking to a sturdy post is fine until the thief simply lifts your bike over the top of it. Similarly that wooden fence might be convenient, but a swift kick to the fence and your bike is gone. Yep, that should keep it safe!